The site is that of the New Abbey Graveyard, about a mile south of the village. Remains: while most of the stone was removed during building of New Abbey House, part of the old friary was converted into a little catholic chapel in Penal times; low walls mark the outline of this building, which was knocked down about a century ago; a tomb of the founder of the friary, Roland FitzEustace, Baron of Porrlester, and his wife, Margaret Janico, is in the graveyard; there is another in St. Audoen’s church Dublin. 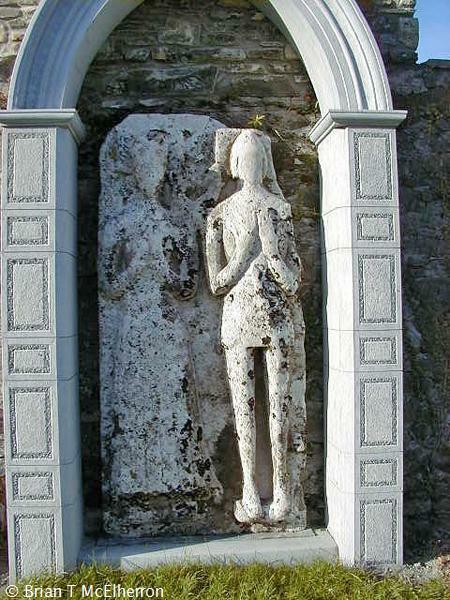 Founded in 1486 for the Observants, the friary of Kilcullen was officially suppressed in 1539. The friars were able to remain in residence until 1547, when they left the area. They made an unsuccessful attempt to return in 1554 and seem to have made no real attempt to take up residence in the area again, except for a short period in the 1640’s.